Laca is an upland rural community with an active women's group. In the cooler upland temperatures ginger grows well, but the market for fresh ginger is very small. The Community Partnering Project helped bring these two assets together. A group of 9 women from Laca decided to research the feasibility of producing ginger tea-locally known as salabat. "Why wait and see? Even as old as we are, we can start with what we have"
this was the attitude of the Laca Women's Group who decided to start a ginger enterprise. The group went on a field trip to visit another community in the province where ginger tea was being produced. The observed the production process and found out what equipment they would need to start making salabat. They visited a supermarket in the provincial capital to research costs of equipment and inputs they could not resource locally, such as sugar and plastic bags for packaging. 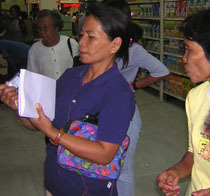 Next they spent time talking to potential customers to find out if there was a demand for salabat. They visited the local market and interviewed stall owners to see if they would sell their product. They were encouraged by the positive response they received. The larger Laca women's group had previously accessed a government loan. Each of the 9 women put 2/3 of their share into a business-development fund. They used the funds to buy ginger and other production supplies to make powdered ginger tea for market testing. With their test product they discovered that there was local demand for their product, particularly from older people, fishermen and the workers at the local electric company. The group now meets 3 times a week to produce the tea. All members of the group are involved in the production or marketing of the salabat. When a member is absent, a family member will take her place. This substitution of labour by other household members follows the established practice of reciprocal labour exchange, or hungus, whereby close friends and kin work on each other's fields. Each member contributes a cup of rice for lunch on production days and a small amount of money is put aside from the enterprise takings to purchase toppings for the rice and snacks. 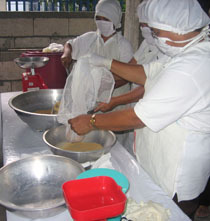 Providing food for the workers on production days follows the longstanding rules of hungus work. Ginger tea is sold to people in the local market primarily, although there are increasing sales to other regions. Markets have been established using the suki system where seller and buyer develop an exclusive relationship built on trust. Profits from the sales of salabat have been used to pay off the members' loans. The group is also setting aside 10% of their earnings for supplies, marketing costs and a small credit facility. The small loan facility incorporates principles from the local revolving credit association, repa repa. The group also pays for transport and snacks for those members doing marketing. After covering these costs, each member takes home about P 180 per week for the 3 days work or P 720 per month. This is a sizeable amount in a community where the average household income is about P 4000 per month. Increased sales has meant that the initial P 60 per worker per production has risen to P 90. While this daily rate is less than the prevailing daily wage of P 120 in Laca, members point out that day labour wouldn't give them lunch or pay off the loan. By local standards, an additional P 720 of cash income is a substantial input into cash-poor households. "There's no-one to consult with...you're alone. But, in groups, there is consultation and discussion and cooperation. The work is lighter. The earnings (sale price) is the same, but there is more produced as profit in the group, because the production is bigger"
Formally, the group has a president and office bearers, but the members describe the group as having a 'flat structure'. "I'm not just a mere member because she's the president. We share the same rights, we work together". Even though the group is registered as an association with the government department that provided the loan, the members rotate tasks and share in decision making.